It’s an honor for us to see one of the greatest guitar players Tim Pierce, testing the VT1 Ultra Trem. He was named as one of the Top 10 Session Guitarists by Guitar World Magazine. Tims’ credits is endless: he has worked for artists, such as Rick Springfield,, Bruce Springsteen, Bon Jovi, Johnny Van Zant, Meat Loaf, Patty Smith, Joe Cocker, Michael Jackson, Joan Armatrading, Madonna, Tina Turner, Rod Stewart, Roger Waters, Ricky Martin, Celine Dion, Eric Clapton, The Doobie Brothers, Elton John, Alice Cooper, Shakira, Carlos Santana, Ozzy Osbourne, Seo Taiji, Luis Jara, Vasco Rossi, Eros Ramazzotti, Jovanotti, Christina Aguilera, Tracy Chapman, Johnny Hallyday, Phil Collins and The Cheetah Girls. One of his early works was playing all guitars on Bon Jovi’s debut single, “Runaway”. Using this experience as a launching pad, he began extending his talents to other musicians, and he has since appeared as a session musician on countless albums. Tim is an extremely versatile guitar player that cover’s many different playing styles. Tim has fully concentrated on his sesion work and gets hired by Producers, Composers and Songwriters from all over the world, as well as creating masterclass videos and being very active on You Tube. We can only say,Thanks Tim. 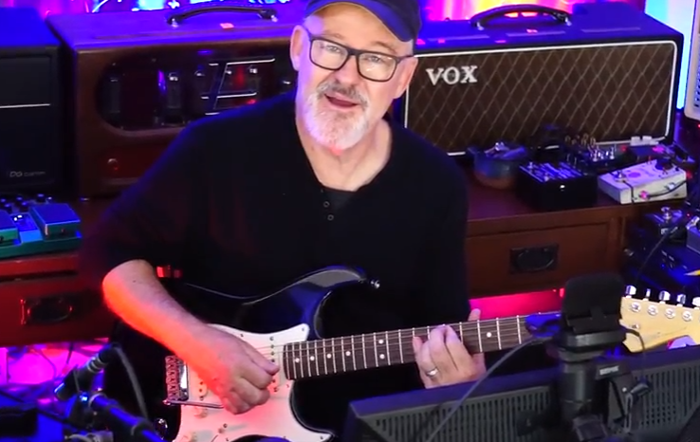 The great Tim Pierce, playing with the VT1 on the stratocaster!